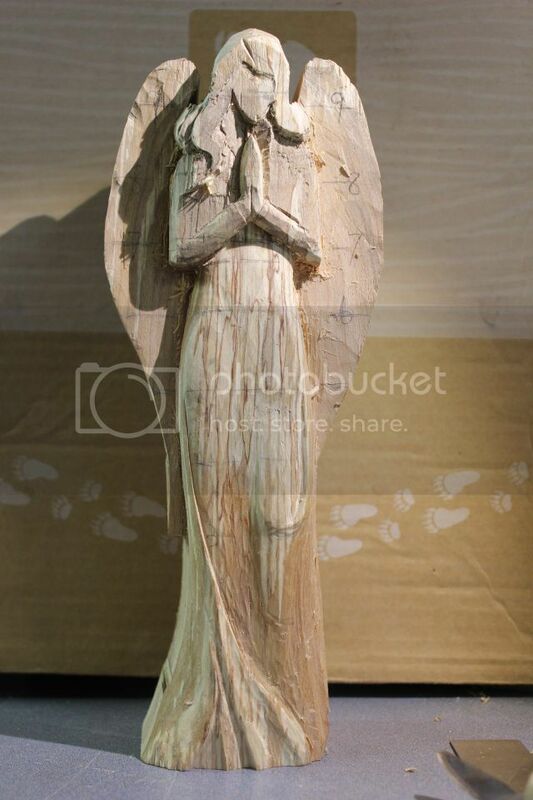 I started this angel in a piece of birch from the firewood pile over Easter. I like how the carving is going, but not the splotchy grain of the sapwood. There is plenty of depth left in the wood to cut the sapwood out and start the carving in the evenly coloured heartwood below. Who thinks I should cut away the sapwood and start again in the nicer heartwood? I say to leave it. The spalting seems all confined to the clothing. The lines follow what might be lines and folds in the cloth. The head & face and the wings are different, as I think they should be. Man lefeave it as is! The contracts is only going to add to this carving. Be sure to keep us posted. My vote is to leave it as is. Looks good! Yeah, I think I would leave it, work with it and let the beauty of the wood be part of the piece. I agree. I would not change it. It appears to be unanimous, leave the spalting there. Thanks for the input. 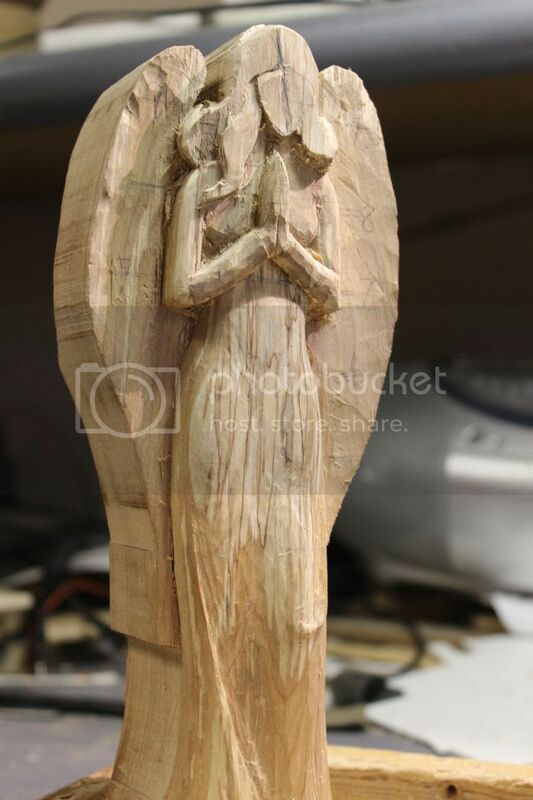 I went and did a little cutting to try to take advantage of the wood colouring, and starting defining the upper body, hair and the plane of her face. The time spent does not show up much. This going to turn out as a great carving, good things come slow---dang it. You do NOT want that spalting. Send it to me and start over. I will carve the spalted wood off and send it to you right away! I\'ve been reading (someplace) that you can take wet chips of spalted wood and bind them to wet fresh, sound wood in a plastic bag and transfer the fungus/bacteria. DIY spalting! I can see no reason why not. The weather is warm enough to use my portable carving bench outside, which means I can get swinging the mallet without the noise disturbing the rest of the family. 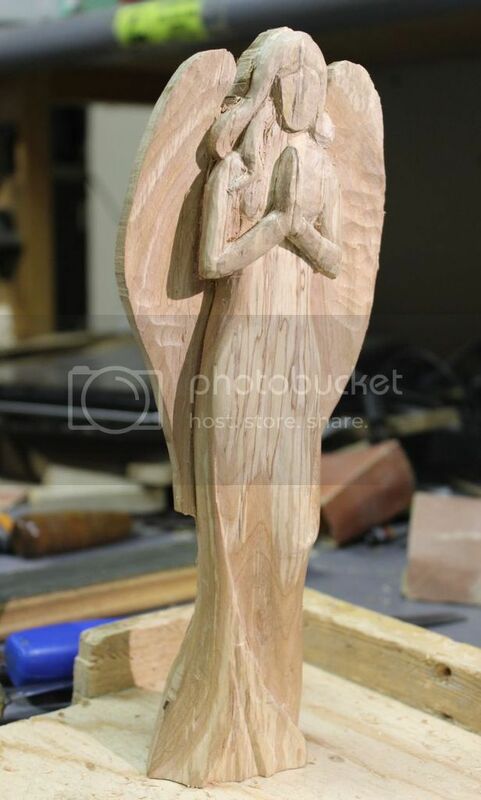 I have done quite a few hours of work on her front but it is not obvious in the picture, but an hour and a half with the mallet and I have the shape of the back her wings and dress all roughed in. I like mallet work! How is the carving held in place while you work?